The folks at Jack White’s Third Man Records in Nashville, TN like to say they do things differently than rivaling studios. Besides their methods for recording live music straight to vinyl, mixing tunes on the fly, the outfit is a one-stop-shop for every contemporary piece of audio artistry. Video production, graphic design, merchandizing, editing, photography, and even live shows are all products to be found within Third Man’s doors. 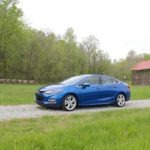 Perhaps when Chevrolet gave journalists a tour of the studio as part of its 2016 Cruze drive program, the automaker was hinting at something: that their latest generation sedan was similarly suited to address the diverse needs of a compact car shopper. When Chevrolet introduced its Cruze in 2011, it was the brand’s first legitimate compact model in decades (the Cobalt doesn’t count), and despite being “out of the game” for all that time, Chevy’s entrant was broadly praised as a handsome, fun-to-drive alternative to the status quo. 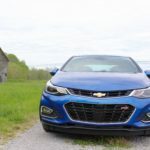 Five years later, while the Cruze continues to sell well for the U.S. automaker, many of the car’s rivals have leveled-up with fresh exteriors, new safety technologies, and frugal motors. In fact, the Cruze was among the least fuel efficient in its 2015 class, due in part to its heft and aging engines. With such formidable competition, Chevy knew it needed more than a mere tune-up for 2016, so it started at the compact’s foundation. Thanks to the use of hot-stamped, high-strength steel and aluminum in parts of the 2016 Cruze’s architecture, Chevy has pulled 53 pounds just from the car’s frame, the largest portion of a 250-pound weight savings total compared to the 2015 model. This new construction method also leads to a 27-percent stiffer chassis. Additionally, the vehicle’s wheelbase is longer by about an inch, affording two inches of much-needed legroom to rear-seat passengers. The suspension is a MacPerhson strut front and torsion beam rear setup, standard for the segment, though Chevy has incorporated front rebound springs and hydraulic bushings in the rear axle to help with ride comfort and handling. 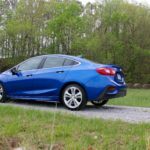 Refinement in the suspension geometry and a quicker steering rack give the 2016 Cruze an enthusiastic driving nature, perhaps only bested by the Mazda3. Plunging into some of Tennessee’s more curvaceous roads, I found the rack-mounted electric steering to offer a respectable amount of feedback, and while front-wheel-driven understeer is inevitable, body roll was held in check. I was also able to give the Cruze a real-world braking test thanks to a navigational blunder. Having just about missed my turn on an abandoned country road, I mashed the brake pedal and came to an admirably abrupt stop with just enough room to make the hard left. All told, the weight reduction and handling tweaks have retuned the Cruze to the compact driver’s car podium. 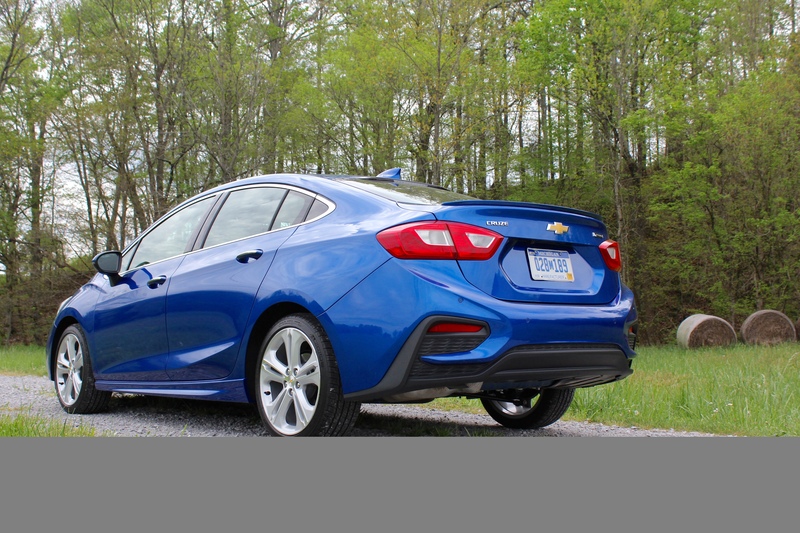 For 2016, Chevy has introduced an all-new 1.4-liter Ecotec turbocharged four-cylinder across its entire Cruze trim line. The new mill produces 155 horsepower and 177 pound-feet of torque, which the automaker claims will get the compact to 60 mph in 7.7 seconds, the quickest sprint in its segment. Offering a single motor across all trim levels enables even entry-level Cruze shoppers to access strong performance and fuel economy figures. LS and LT Cruze models paired with the new six-speed automatic transmission will manage 30 mpg city and 42 mpg highway, while the manual-equipped cars lose 1 mpg of city and highway efficiency. If you want the Premier spec, which is weighed down by more features and a Watts linkage rear suspension, you’ll still average 30 mpg in the city, but sacrifice 2 highway miles per gallon. Though I didn’t have a chance to sample the manual-equipped model, the six-speed automatic is vastly more refined than its predecessor. Shifts are smoother, quicker, and more in tune with driver behavior. Rival models that have transitioned to CVT’s may benefit from an extra ounce of fuel efficiency, but the sacrifice to performance is made more obvious after driving the Cruze. The new motor is more than spritely at low-speed acceleration, though passing power isn’t abundant. At full throttle, the Cruze also yields a bit of torque-steer, but not enough to pull the wheel harshly in one direction. When the hatchback version hits showrooms this Fall, it will be interesting to see if this engine is as competent propelling the added weight, but at least in sedan form, Chevy’s Ecotec unit is among the sweetest in its class. While many vehicle segments are in flux, the compact car buyer has remained young, tech-savvy, and style-focused. To that end, how does the 2016 Cruze stack up? 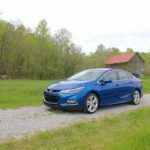 Design has been critical to the Cruze’s success these past five years, and thankfully, Chevy hasn’t fussed with the car’s exterior too dramatically. Elements of the shapely new Malibu can be found in the Cruze’s front and rear fascia, which suit the car just as well as its big brother. Like the Malibu, the profile is my favorite angle, with handsome body panel creases and a smooth transition from roof to boot lid. Inside, it would appear all but the driver’s display and gauges have been refined, softened, and modernized. I wish the piano black trim trend would die already, but there are worse crimes to commit within a cabin. In Premier spec, the leather seating surfaces are comfortable while the front buckets themselves are nicely shaped and bolstered. Chevy’s MyLink infotainment system is surprisingly quick, thanks to an all-new processor, and the screen is effortless to navigate. A 7.0-inch screen is standard while an 8.0-inch unit is available on upper trim levels. And here’s where we get into the Cruze’s appeal to the compact market. 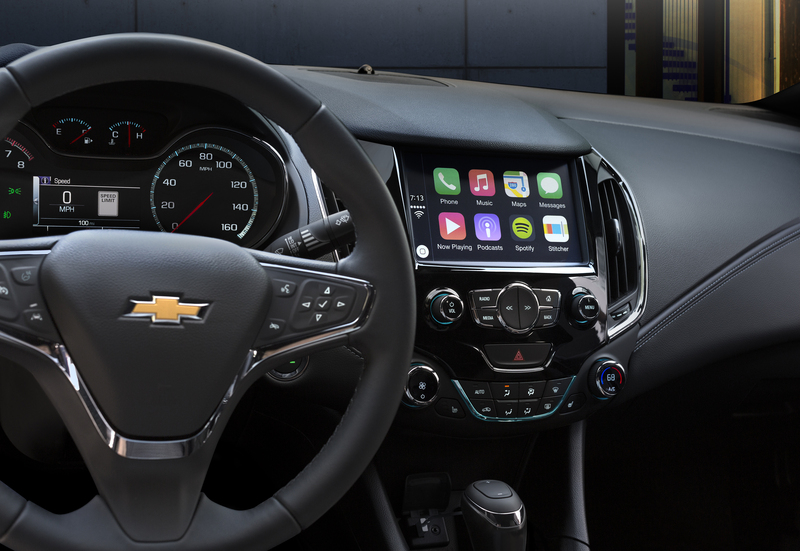 All LT and above trim levels come standard with a 4G LTE wifi hotspot, 24 gigs of data (or two years, whichever comes first), Onstar, Apple Carplay and Androd Auto. No other compact offers the same level of connectivity. Onstar has been among Chevrolet’s talking points for a while now, but it’s worth revisiting the technology for a moment, as some may be unaware of what it entails. All 2016 Cruze vehicles will come with access to the Onstar app, which lets drivers remotely lock/unlock their cars, start them, and check vehicle diagnostics. While the 2016 Civic also offers some of these features, they aren’t standard. If you opt for LT and above trims, you’ll also get Onstar’s concierge service. Chevy has incorporated a few new safety goodies for 2016 (and keeps 10 airbags standard), including lane keeping assist, rear cross traffic alert, and forward collision alert with distance monitor. While these are all great features and performed well during my tests, I’m stumped as to why adaptive cruise control isn’t even available as an option. It’s not as much a safety feature as it is a convenience function, but compact cars often equal commuter vehicles, and driver fatigue is reduced considerably with adaptive cruise control. The combo of updates for 2016 put the Cruze sedan back in the leadership circle of compact offerings. While some challengers can be optioned to luxury car-rivaling specifications, the Cruze sticks to its strengths as a frugal, attractive, and spunky driver’s choice. Pricing for the 2016 Cruze kicks off at $17,495 (including destination) for the manual-only L trim, $18,995 for LS, $20,995 for the LT, and $23,995 for the range-topping Premier grade. The Premier is the only grade that comes exclusively with a six-speed automatic, while LS and LT trims can add the auto gearbox for an additional $1,000. The only other standalone package is Chevy’s RS styling kit, which retails for $695 on LT vehicles and $995 on Premier cars, where it adds 18-inch wheels. The 2016 Chevrolet Cruze is on sale now.